In 1964, Shelby American, today a wholly owned subsidiary of Carroll Shelby International Inc. introduced the FIA version of the small block Cobra, which competed in the 1964 World Manufacturers Championship series against marques like Aston Martin, Jaguar and Corvette. 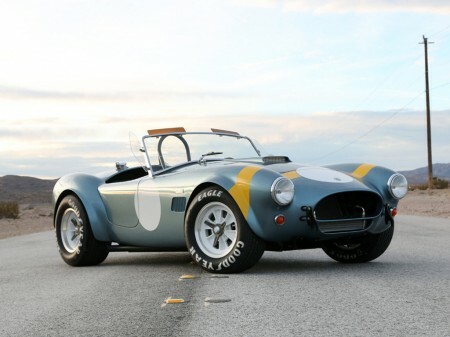 To celebrate the birth of the 289 Ford powered roadsters, Shelby American will offer 50 limited edition continuation (CSX7000) Shelby 289 FIA Cobras. Each will be painted “Viking Blue” with FIA stripes and roundels, feature a black FIA interior, special billet anniversary badges, original style wheels and a variety of additional options. The 50th Anniversary FIA Shelby Cobra will be introduced at the annual Barrett-Jackson Auction in Scottsdale, Ariz, on Friday, Jan. 17, 2014. Shelby American built the 289 FIA Cobras for racing; modifications included a new dash, widened front and rear fenders, cut-back doors, new dampers, racing wheels featuring the pin-drive hub, oil cooler scoops and a competition spec 289 small block engine. Today, the CSX7000 Continuation Shelby Cobra 289 FIA’s are component vehicles that can be fitted with a proper drive train by a customer or automotive professional. Each car is built to order and delivered as a rolling chassis, less drive train, with a Shelby American issued MSO. The Continuation Shelby Cobra 289 FIA vehicles retain everything from the authentic style suspension to the graceful body lines, but are upgraded to contemporary standards. Shelby American uses modern disc brakes, a stronger frame and the bodies are available in either aluminum or fiberglass. The 50th Anniversary Edition also features a complete exhaust for a small block Ford V8, a special fitted car cover and optional detachable steering wheel.